$20/person before December 21 -or- $25/person at the door. For online tickets click here. 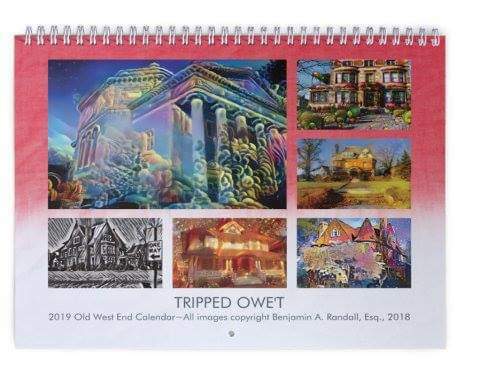 Get your Exclusive 2019 TRIPPED OWE'T Wall Calendar (with holidays and unique photos of Old West End sites. All photos copyright Benjamin Randell, Esq. 2018) Pre-orders accepted, estimated pick up by 12/15/18. $25.00 for USPS delivery (credit card/postage fee). The Arts Commission’s Art in Public Places Program is partnering with Mercy Health to commission public artwork for roundabouts in the newly constructed Cherry Street Coridoor. You are invited to hear an overview of the project, learn about the sculpture acquisition process and meet the members of the Design Review Board who will select the artist. Join Old West End Neighborhood Initiatives for a community discussion on the origins of criminal activity. What leads people to commit crimes against others? What needs are not being met? How do we move forward with practical measures for improvement? Local community leaders will provide insight into this topic as we advance the conversation to understand where the crime issue begins. This event IS an OWENI community meeting, and will begin at our normal time of 6pm at Kent Library on Tuesday, January 16, 2018. We hope to see you there! This event will be catered by the Toledo chapter of Food Not Bombs. Jewelry, pottery, and papercuts in the Old West End, this Saturday, Sunday, and Monday. Perfect for last minute gifts! Please join BGSU and UT architecture students on Friday, December 8 for a community exhibition of their final projects related to the Old West End Neighborhood. In fall 2017, the Bowling Green State University senior architecture students have worked on community-based visioning projects in the Old West End Neighborhood and larger Toledo area. The urbanism studio was conducted in a close collaboration with the University of Toledo's urban design class led by Dr. Sujata Shetty. Student projects have integrated urban agriculture and blight remediation concepts, coupled with focused research on larger public policy issues associated with and impacting their designs. In addition to a formal review, their concepts will be exhibited for the community on Friday December 8 from 5:30-7pm at the Collingwood Arts Center Pride Room, 2413 Collingwood Blvd. The Libbey house is having a Vintage Glass Sale (from the 1940’s and 50’s) this Saturday, November 4th, from 10am-4pm. Graciously donated to the Libbey House Foundation from a former CEO of Libbey. Lots of old Libbey glassware and most is in its original packaging. Along with lots of new glass serveware, barware, teapots, etc. The Toledo Museum of Art is encouraging area residents, especially those who live in the city’s Old West End, to offer input Friday about the future of a historic, U-shaped collection of five apartment buildings next to its Monroe Street campus that it is acquiring. Lunch will be provided at the event, which will be from 11 a.m. to 1 p.m. at the Toledo-Lucas County Public Library’s Kent branch, 3101 Collingwood Blvd. Join us for a stroll through our beloved Old West End to sing Christmas carols and spread Christmas cheer. Meet at 2448 Robinwood as early as 5pm Thurs, Dec 22nd to begin a practice session before we head out at 6pm. Neighbors on Robinwood and Scottwood Avenues will be encouraged to leave their porch lights on to invite us to sing for them. *Feel free to dress in festive attire, bring something to light the way as well as musical items to enhance our presence. *Hot cocoa and warm apple cider will be offered, bring a bottle of your favorite adult warmer to add a little liquid courage. *Printed songs will be available for a few popular songs which we can rotate through as we go. *Children are welcome though I may look at having a sitter at my house for the little, little ones (parents could pay $5 for this service). Please let me know if you might need it. Join Santa in the Historic Gerber House (Collingwood Arts Center) for cookies and cocoa 12/20 from 6 - 8 pm! This is a FREE event for the community!!! So, bring the little ones out to tell Santa what they want for Christmas! The City of Toledo will be doing Leaf Collection during these dates for the 43620 ZIP code. Watch for Leaf Collection signs, do not park your cars on streets with those signs, and rake your leaves just over the curb. The City of Toledo will be doing Leaf Collection during these dates for the 43610 ZIP code. Watch for Leaf Collection signs, do not park your cars on streets with those signs, and rake your leaves just over the curb. The Arts Commission is pleased to announce a dedication and artist talk with artist Mark Lere in celebration of the recently completed “Houses in Motion” sculpture installation. The commissioned artwork is sited along Collingwood, between Ashland and Central, utilizing the islands that were recently built as part of the Collingwood re-surfacing project. The design review process, which was initiated in late 2011, resulted in the selection of a design consisting of five large pieces by California artist, Mark Lere. The reception will be held at The Collingwood Arts Center, 2413 Collingwood Blvd., Toledo. Councilwoman Yvonne Harper invites City of Toledo residents to attend a community forum to provide information about the proposed “Lead Safe Residential Rental Units” ordinance. District 4 Councilwoman Yvonne Harper will host a public forum to address the proposed Lead Safe Residential Rental Units Ordinance currently before Council. The Lucas County Health Department and other contributing agencies will also be in attendance. WHERE: NEXUS Healthcare Facility, 1415 Jefferson Ave.
WHY: In response to ongoing reports of the effects from lead-contaminated dwellings, Toledo City Council currently has before it an ordinance that seeks to address those concerns. An open community forum has been scheduled to present information to the public regarding the proposed Lead Safe Residential Rental Units Ordinance. The free festivities will feature food trucks selling street snacks, music performances by community groups, and the debut of the campus-wide sculpture exhibition Jaume Plensa: Human Landscape. At The Toledo Museum of Art, 2445 Monroe Street. Food trucks, music, art, tours until 6pm. A variety show starts at 7pm, and includes Bird's Eye View Circus, T-Town Tassels, and Stone Productions. At the Collingwood Arts Center, 2413 Collingwood Blvd. "Save the Libbey House" will feature a gourmet dinner by Scott Pierce of Tree City Catering with hors d’oeuvres and desserts provided Vendome Pastry. All proceeds will benefit the Libbey House Foundation, a 501(c)(3) nonprofit. For more info, click here. At 2424 Scottwood Avenue. For more info click here.